Sharknado 4 is coming this summer! Of course it is. And it's not letting a good Star Wars reference go to waste. Syfy has announced the official title of this anticipated sequel is Sharknado: The 4th Awakens. And it will be flooding the cable network on Sunday, July 31 at 8pm. You better set your DVRs right now, because this will truly be the TV event of the summer season. 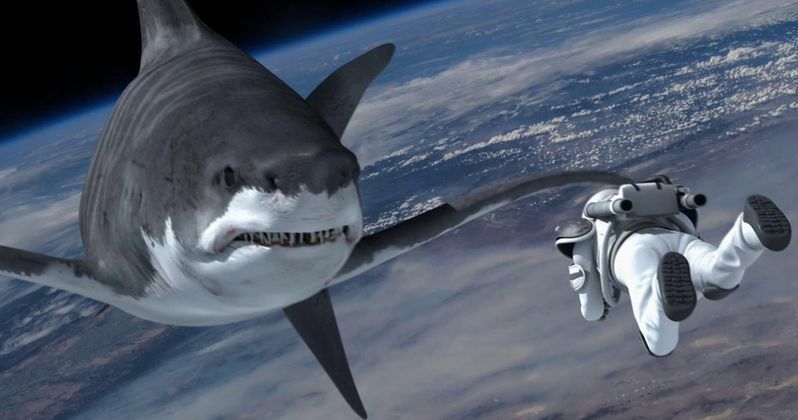 Sharknado: The 4th Awakens promises to deliver the biggest shark storm seen yet. Yes, there will be sharks-in-tornadoes! The sequel to last summer's Sharknado 3: Oh Hell No! will pick up five years later. The East Coast has finally recovered from the thrashing it took. Fin, once again played by Ian Ziering, is living peacefully with his family. And the world at large has become blissfully Sharknado-free. But now, Sharks are starting to get whipped up in dusters that seemingly appear out of nowhere. These new Sharknados are landing in the least expected places. And in ways that no one ever saw coming. But in a world where Donald Trump is the GOP front-runner, anything and everything is possible. And the movie will kick off with a big surprise. As previously reported, Sharknado 3: Oh Hell No! ended on a huge cliffhanger. Did Tara Reid's April live or die? After the last sequel was broadcast, fans were asked to infiltrate Twitter and vote on April's fate. While we don't yet know if Tara Reid will be starring in the movie, she will appear to reveal the outcome of the #ApirlLives or #AprilDies social media campaign. Even if fans voted for her untimely demise, we have it on good authority that April won't stay buried for long. And we might even get to see an April ghost, fingers crossed! David Hasselhoff will return as Gil Shepard, with Ryan Newman playing Claudia Shepard. Gary Busey is set to be introduced as April's dad. As of now, none of the amazing cameos for Sharknado: The 4th Awakens have been revealed. Asylum is once again producing the sequel, along with Anthony C. Ferrante returning to direct and Thunder Levin writing the original screenplay. Stay tuned for more Sharknado: The 4th Awakens goodness as we get closer to the release date!